Update, November 6: Injustice 2’s PC multiplayer is live, and will run through November 10. After an unceremonious delay on the day it was supposed to go live, Injustice 2’s PC beta is now up on Steam, ready to be downloaded and enjoyed at your leisure. Check out our list for more upcoming PC games. The beta will run today through November 10. You’ll only be able to dig into 1v1 multiplayer, but all stages and every character – including DLC fighters up through Raiden – are available. The full game will be available November 14. Update, October 25:Injustice 2’s PC open beta isn’t out today after all. NetherRealm announced yesterday that DC superhero fighter Injustice 2 would be coming to PC, with an open beta to begin a day later – that’s today, as you’re reading this. However, today is here and the beta is not, because it just got delayed in the most unceremonious of fashions. The official Injustice account just tweeted out the delay yesterday, promising more details soon. The PC beta will NOT begin tomorrow. Stay tuned for more information! That’s a bizarrely sudden change of plans, and I’d venture to guess it’s the result of some sort of technical snafu on the back-end. Perhaps somebody forgot to push the big red button on Steam since the store still doesn’t have a listing for the game just yet. Either way, I doubt we’re waiting much longer to see that beta. Original Story, October 24:Injustice 2 is coming to PC. 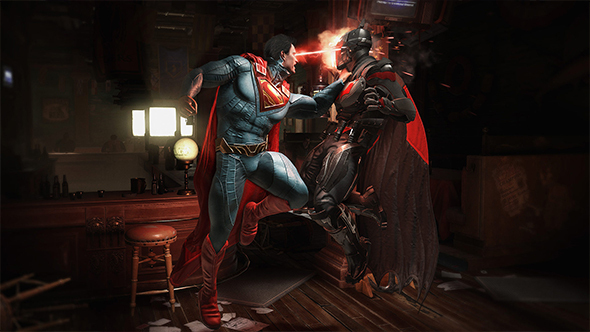 The DC Universe fighting game was released for Xbox One and PS4 back in May of this year, butrecent retail listings had hinted the game was on its way to PC. In a press release from Warner Bros, the company say that Injustice 2 is coming to PC via Steam and the Windows Store “this Autumn.” While no date has been announced for the game’s full release, “fans will be able to participate in an open beta” from tomorrow, October 25, via Steam. The game’s port is being handled by QLOC. Much like its predecessor, Injustice: Gods Among Us, Injustice 2 features a roster full of DC super heroes and villains. Those range from the standards, like Batman and Superman, to the less well known, like Gorilla Grodd. Alongside the game’s multiplayer mode, there’s also an “epic” story mode to get to grips with. You can check out a reveal trailer above.